When the local inland wetlands agency required these property owners to come into immediate compliance with a wetlands permit requiring mitigation plantings. agency approval was secured for pond restoration buffer planting plan without incurring any fines. In the original design with lawn running right up to the edge, nitrogen-rich fertilizer did not have to travel very far to wind up in the water. Additionally, sediment from a nearby stream was washing into the pond and filling it up with muck, branches, and other pieces of biomatter. As a result, the stagnant, nutrient-laden pond water played host to a thick carpet of algae. 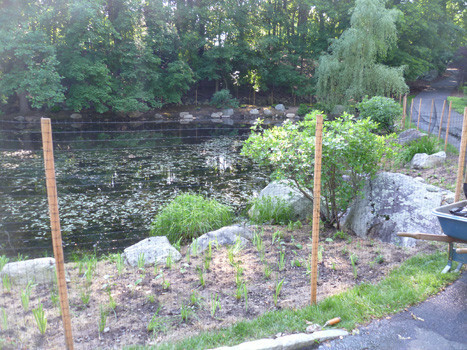 The pond restoration buffer planting that took inspiration from the native shrub, perennial, and fern species from the adjacent wetlands. With less fertilizer-laden runoff entering the pond, the existing aeration system is better able to keep the algae problem in check. 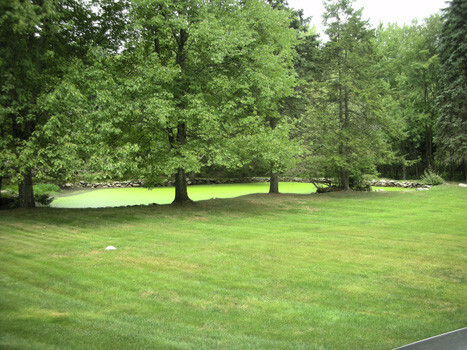 This property’s small pond is connected to a twin just a few dozen feet away on the neighbor’s parcel. However, the difference in water quality between the two could not be more stark. On one side of the property line -- a shallow, algae-choked, dirty pond full of leaves. On the other side -- a deep, clear, pristine pond. What was causing such a discrepancy between two adjacent bodies of water? The key difference was the settling out of sediments in the first pond that were not flowing into the second one. In essence, the health and vitality of the second pond was coming at the expense of the first. In order to rectify this problem, a three-pronged approach was selected to address the algae, the water circulation, and the accumulation of sediments. 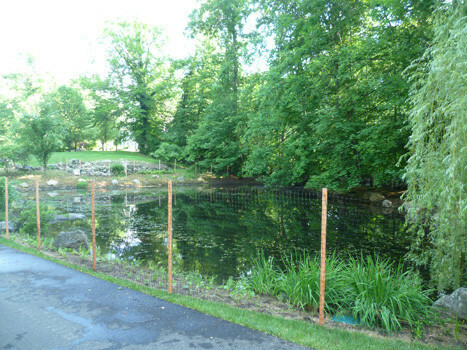 The first phase of pond restoration began with reducing the amount of lawn areas adjacent to the pond. This minimized the amount of nitrogen-rich fertilizer that could potentially run off into the pond during a rain storm and cause algal blooms. 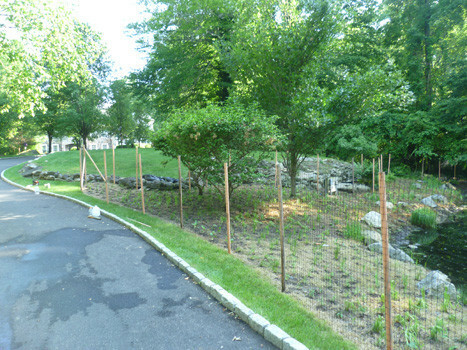 At the same time, a vegetated buffer planting was installed where the lawn used to be. These native pond species act as a filter for any runoff, preventing nitrogen from entering the pond. Additionally, they provide important habitat and food sources for a variety of local amphibian, insect, and bird species. 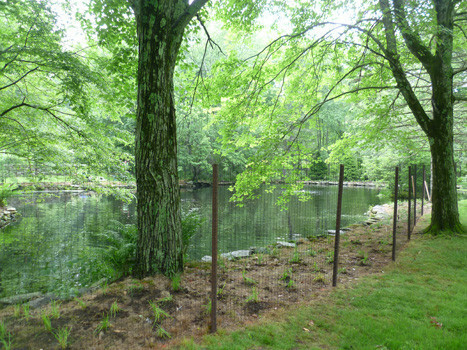 Increasing water circulation comprised the second phase of the pond restoration project. 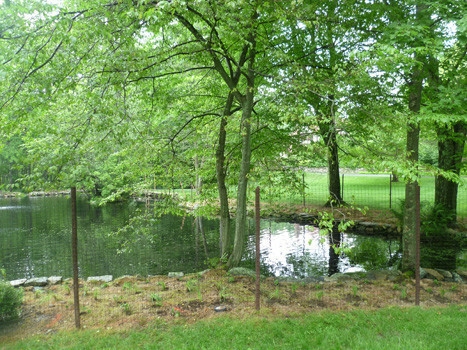 Installing compressor pumps and pond diffusers helped to move the water around the pond, keeping algae from growing and preventing biomatter from accumulating in any one spot. 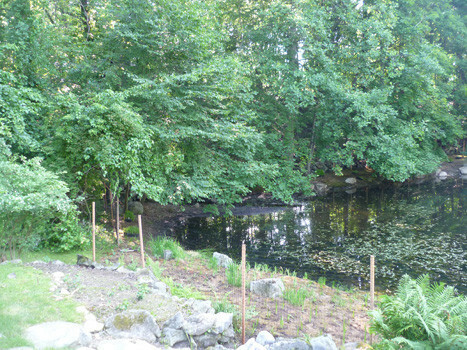 Biomatter removal was the final and most challenging phase for this pond restoration. A deliberate choice was made to avoid the legal, financial, and environmental costs associated with dredging. As such, organic accumulation is being controlled using more delicate methods. Algae and other materials are skimmed over the surface of the pond as they build up. Beneficial bacteria are added periodically to accelerate the natural rate of decomposition. When taken together, all three strategies improve water quality without resorting to harmful chemicals or damaging dredging.